I've only gotten to experience Father's day twice in my life. I wish I could say I've had the joys of experiencing it more, but that's simply not the case. This year was extra special. My loving wife held the biggest secret of her life. "Shane, we need to bring your bike to the bike shop, and you'll have to take everything off of it. My heart was racing. Not because of the thrill of upgrading to a new bike, but my wife knows more about bikes than most spandex clad Fred's do. We headed over to see our friend Fabien at Serious Cycling in Northridge. 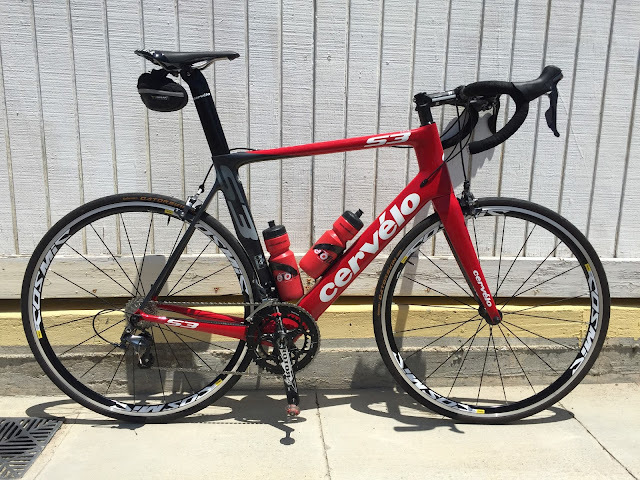 While I ran around the bike shop like a kid in a candy store, a Red Celvelo S3 seemed to jump out at me. "Do you like it"? My wife asked. It was love at first site. Well after seeing her of course. We were able o sell my beloved Giant TCR Advanced SL4 back to the dealer buy back program, and after a quick fit, Serena was on the back of my car headed home. The S3 is a super stiff, race aero road bike. My first ride unfortunately wasn't until a day later, which found me cycling up to the Bouquet Reservoir. The heat was blistering down and started to effect my ride. The temps reached 118 degrees, and I decided to salvage Father's day and head home. All and all, I absolutely love this bike. This has been the greatest Fathers Day ever! Can't wait to see what I get for Christmas.